Certified Master Alchemical Hypnotherapist and Life Between Life Facilitator and author of The ABC's of Never Having Another Bad Hair Day. Who was or is your mentor and why? I have had many mentors. Ronney Aden that started me on my journey is still holding my hand as we walk together on our independent journey’s together. I believe our mentors can change as we evolve. Each one takes us another step. Although, I will always hold Mike Mooy close to my heart as my first. The people that inspire me are the ones that have persevered through their life and made a difference. The teachers and facilitators that hold classes and help others find their uniqueness and peace in their lives. I have been a hair stylist for over 45 years. A hypnotherapist for over 20 years. 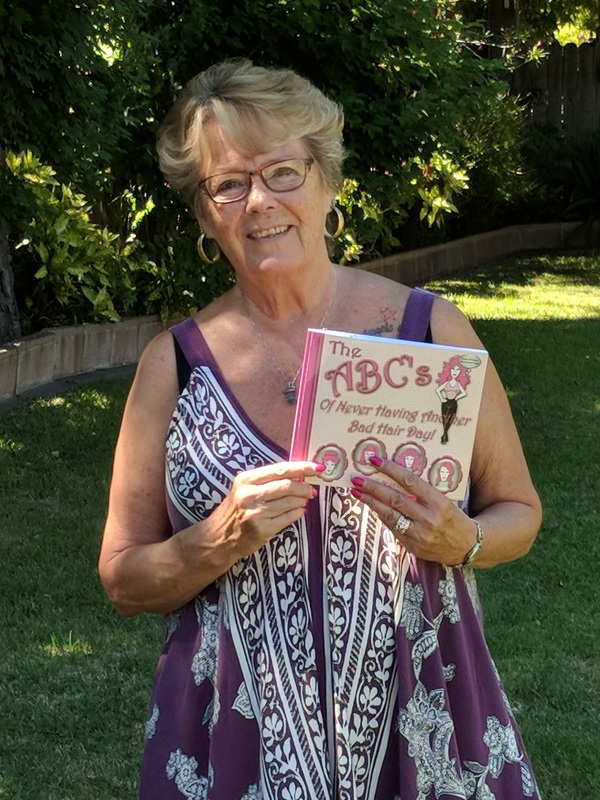 I write about those experiences in my book The ABC”s of Never Having Another Bad Hair Day and my upcoming book From Behind the Chair. I also write about my molest issues, death issues, marriages and divorces, transgender issues in my life and much more. I have traveled the world for work and recreation. I write about how knowing my guides has helped support me through every mile of my journey. I also write about how I changed or healed many issues in my life using many holistic modalities especially hypnotherapy and Life Between Life session. During all of this I also graduated with a Ph.D. in Metaphysical Sciences. What are you personally working on at present? Presently I am working on finishing my second book From Behind the Chair. Setting up a blog to connect with many more people. Working on setting up on line classes to help the masses. Beginning to set up in person classes again. While maintaining the beauty salon and my hypnotherapy business. What have you NEVER revealed about yourself? Oprah for starters. President Obama. Many of the authors I have studied under to tell then Thank you in person. If there were NO obstacles, what would your life look like? My books would be published by an amazing publisher that supported me in setting up book signings, classes and social media. I would be traveling to all parts of the globe to hold classes to help others come to peace with their wholeness. For more information about Jeri click here. InnerView with Dr. Robert V. Gerard - Holistic Psychologist, author, lecturer, visionary healer, philosopher and poet. And Ms. Zeljka Roksandic - Clairvoyant, spiritual-therapeutic coach, lecturer, author, artist, and healer. · Zeljka: Archangels, Angels and Ascended Masters such as Christ, Mother Mary, Buddha, Usui, Saint Germain, Kwan Yin. They teach me universal (out of Earth) truths, wisdom and skills. · Robert: I guess it was the Great Guy up in the Sky. As a Child, with a Catholic upbringing, most Jesus and Mother Mary. Then it was primarily St. Germain who encouraged me to manifest the transmissions from Him. · Zeljka: quick, in depth energy and past life readings, finding seed of the issues, and changing the outcomes. · Robert: My resilience keeps me going. Despite all the challenges, here I AM, with a smile, of course. · Robert: Sustaining Peace within my heart seems to capture my true self. But I love to write and inspire people whenever I get the chance. · Robert: All my “Bad Boy” stuff that gave me Life learning lessons. Despite my extroversion, I enjoy my solitude. · Zeljka: I live the old saying: “Eat breakfast like a king, lunch like a prince and dinner like a pauper.” I do not like dinners. · Zeljka: Similar as I live it right now, and in addition spend more time with my Grandkids, facilitating more seminars, meditation and healing groups, writing more books. · Robert: To be the KING of PEACE. To override the Establishment worldwide. Bring Truth back to this Planet. Encourage people to express their Divine Nature. · Robert: Making love to everything. Embracing beauty and advocation goodness. · Zeljka: Whatever I do, I do it thoroughly and right for the first time, reaching for perfection of my service. · Robert: Being free from obligations and to complete every creative pursuit I started. Is there a philosophy you live your life by or apply to life on a daily basis? · Robert: To uphold the good I absorb from the Cosmos and the many Master therein. For more information on Robert & Zeljka please click here.